These champagne flutes are in nice, unused, condition. ITEM ~ Pair of Champagne Flutes. PATTERN ~Cocktail Party. DESIGNER ~Ralph Lauren. STYLE ~Elegant ~ Lovely Presentation. MATERIAL~ Made in Germany of Fine Crystal. Signature Logo Etched into Base of Flute. Champagne Flutes. champagne flutes adorned with lovely. Austria Pattern, 24% Lead Crystal. Austria Pattern, 24% lead crystal with. This is a beautiful set of contemporary crystal. when tapped on the rim! Champagne Flutes. China Unlimited Discontinued China, Crystal, & Sterling Flatware Matching Service. SET OF FOUR. We will replace the item(s). Oleg Cassini Crystal Glitter Pearl Champagne Flutes-set of 2. Condition is New (other); never used, open box Original box, packaging and "care instructions". Shipped with USPS Priority Mail. Classically shaped bowls feature bold wedge cuts and diamond cuts. These stunning crystal champagne flutes / glasses are made of fine French Crystal. They will be an amazing addition to your collection and great for serving your favorite drink in luxury. The haveDiamond cutting pattern at the bottom which highlights the beauty of these glasses. Champagne Flutes Dishwasher Safe Handmade. These stunning crystal champagne flutes / glasses are made of fine Crystal. They will be an amazing addition to your collection and great for serving your favorite drink in luxury. The haveDiamond cutting pattern at the bottom which highlights the beauty of these glasses. Set of 6 Bohemia crystal 7 oz. Made in Czechoslovakia. 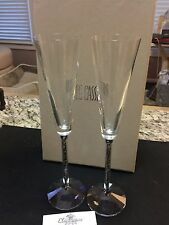 For sale is a NIB Set of 2 Oleg Cassini Crystal Hermatite Toasting Flutes. These never used champagne flutes have there labels still intact on there bases. The gift box is in a excellent condition without any wear or scuffs. Very simple and stylish Modern Deco style for special occasions. Up For Sale a Set of 2 Beautiful Ruby Red & Clear Stem Champagne Flute Glasses. CRY 3335/3365. Champagne Flutes. This applies to the continental United States lower 48. I will be in touch with you, generally within the hour. If its late or on the west coast, it may be in the morning. I will take care of the incident. Trumpet champagne flutes. Crate and Barrel. Hollow stem. Set of two. SET OF 5Colored Stem Champagne Wine Swag Draped Goblets Gold Rim. (There may be a few manufacture inclusions (bubbles, flea bites, straw marks in the glass; this is common in old glass). 2~Yellow / 2~Green / 1 Pink. ). 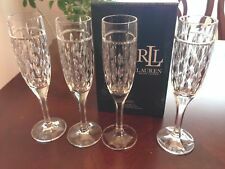 Set of Four (4) versatile Oscar de la Renta Crystal Flutes suitable for use with Champagne, Wine, Juice, etc. Excellent like-new condition, signed on base. Great for enjoying your Mimosa's. One flute has a small chip on the base. Champagne flutes. Set of four. (see last photo). These flutes have a etched swirl pattern I believe there is a little more orange than pink both flutes have no flaws and are in excellent condition each flute is 11 1/2" tall x 3" wide and total weight 1lb 2oz. Thick gold trim on the rim with an etched design. Stunning set of 8 champagne flutes/wine glasses. Perfect for wedding toasts, anniversary celebrations and parties of all kinds! Set of 4 Beautiful Crystal Champagne/Wine Flutes. They have a diamond point like pattern on the glass and lower section of the stem. I am unsure of the maker of this glass. 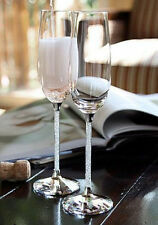 Set of 2 champagne flutes perfect for a couples wedding toast. 2 piece in Nice Wedding Gift Box. Special designed glass stem filled by tiny crystal diamonds. We want to make purchasing from us an easy experience. Pre-owned but never used. This set she received as a wedding gift 30 years ago but never used them. They're in perfect condition with no scratches or cracks. A gorgeous green glass bowl with optic design sits atop a stem with a nice swirl designs. See the gallery photos. They still have the original stickers on the base, they are new, prior owner got them for a gift, they never used them. BY GODINGER. SHANNON CRYSTAL. CHAMPAGNE TOASTING FLUTES. DUBLIN PATTERN. SET OF FOUR (4). 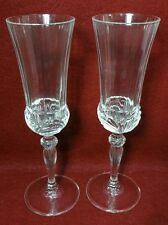 Set of 2 champagne flutes in Malibu pattern produced by Sasaki. Each stem features a clear bowl with black zig zag stem and black foot. Still in the box. Stunning artistry on this set of glasses. In very good condition. Have never been used. Have original stickers. Ultra clear crystal glass. Made in Italy. Four (4) champagne flutes from Riedel in the PANTHEON pattern. Column stems with discs at top and bottom. However, we are not experts. Set of 4 Beautiful Crystal Champagne Flutes. Swirl Optic Pattern. These are lovely champagne glasses! Beautiful ribbed crystal with smooth stem. Glasses measure 8.5" tall and 2.5" wide. They are stamped France on bottom. Excellent condition! Please check out our other vintage items in our Store~~Vintage and New Variety Shop! Buy today and we ship next business day! Gorham Rosecliff. Set of 4 Fluted Champagne glasses. THE STEM IS 2" HAS A MULTI FACETED BALL. Never used, mint condition, 6oz. These were the FINEST CUT CRYSTAL AVAILABLE (over 24% lead). MADE IN CZECHOSLOVAKIA. ROYAL CRYSTAL ROCK crystal AUREA pattern Flute Champagne -Set of Two (2) -8-1/2"